In 2010, astronauts used the Destiny laboratory, aboard the International Space Station, to grow these sodium chloride crystals. The solution was held as a lens-like drop in a 50-millimetre metal loop. Distinctive "hopper growth" can be seen. Characterization of sodium chloride crystals grown in microgravity, Fontana, Pietro; Schefer, Jürg; Pettit, Donald. The following abstract 2011 Elsevier B.V.
"NaCl crystals grown by the evaporation of an aqueous salt solution in microgravity on the International Space Station (ISS) were characterized and compared to salt crystals grown on earth. NaCl crystallized as thin wafers in a supersaturated film of 200-700 μm thickness and 50 mm diameter, or as hopper cubes in 10 mm diameter supersaturated spheres. Neutron diffraction shows no change in crystal structure and in cell parameters compared to earth-grown crystals. However, the morphology can be different, frequently showing circular, disk-like shapes of single crystals with <1 1 1> perpendicular to the disks, an unusual morphology for salt crystals. In contrast to the growth on earth the lateral faces of the microgravity tabular hopper crystals are symmetrical because they are free floating during the crystallization process. Hopper cubes were produced without the need to suspend the growing crystals by an ongoing stirring. 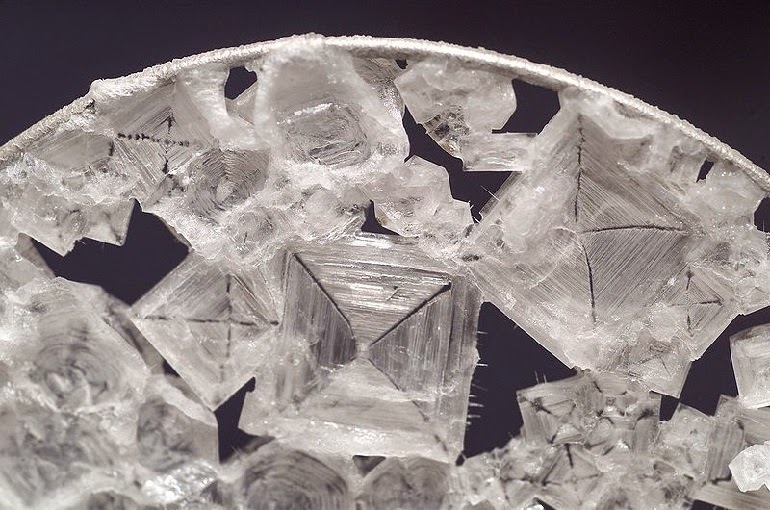 "Fleur de Sel" is shown as an example of two-dimensional growth of salt on earth and compared to the space grown crystals. It is shown that in microgravity conditions brine fluid inclusions form within the salt crystals." Expedition 6 astronaut Dr. Don Pettit grew salt crystals in stretched films of supersaturated solution so that the salt water only fed the crystals around the edges rather than from all sides. The following video shows that surface tension plays a surprisingly dominant role in the crystal formation and convection is more active than one might expect. The island of Elugelab, Enewetak Atoll, Marshall Islands, site of the U.S. Ivy Mike hydrogen bomb test (1952). Before, and after detonation.